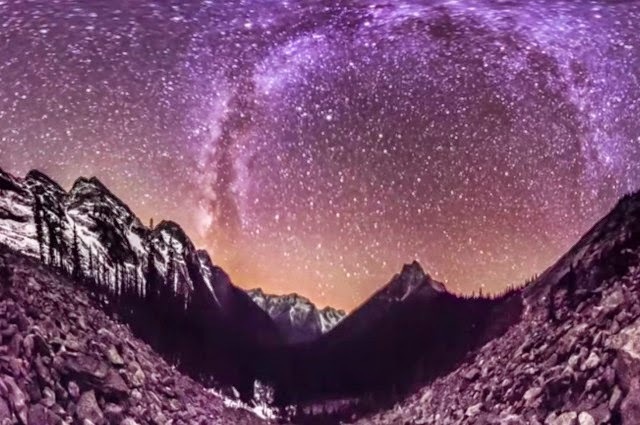 Professional photographer Vincent Brady has been capturing time lapse images of the night sky for many years, but decided to add a little more interest for viewers and create a video providing a 360-degree, panoramic sight of the stars. Just a few years ago, he developed a arrangement prepared of four different cameras, each viewing the sky using a fish-eye lens. As we know Earth has an equatorial revolution speed of 465.1 m/s, so the sequence of thousands of 1-minute-long disclosures provides a gorgeous, swirled sight of the stars as they seem to move throughout the night. The photos are captured from all over the United States and up into Canada, counting Missouri, Devils Tower in Wyoming, the Rockies in British Columbia, and also the sandstone monuments all over the US Southwest. The finished time-lapse is entirely remarkable and the acoustic guitar music, produced by Brady’s high school buddy Brandon McCoy, is indeed relaxing and is the perfect balance to the video. Don’t forget to switch the video to HD, go full screen, and enjoy…….!!!!!!!!! !